Co-owners of RCHMND, Kristi Smith and Peter MacDonald met while working in Toronto and realized they had a lot in common, including a desire to open a retail concept in Halifax. Since its 2012 opening, RCHMND has become the cultural hub that discerning Haligonians didn't realize they desperately needed. Tastemaker is a heavily bandied-about term, but this duo lives up to the moniker. Smith says one of the best parts of retailing is getting to know the customer and offering them pieces they didn't know they needed. 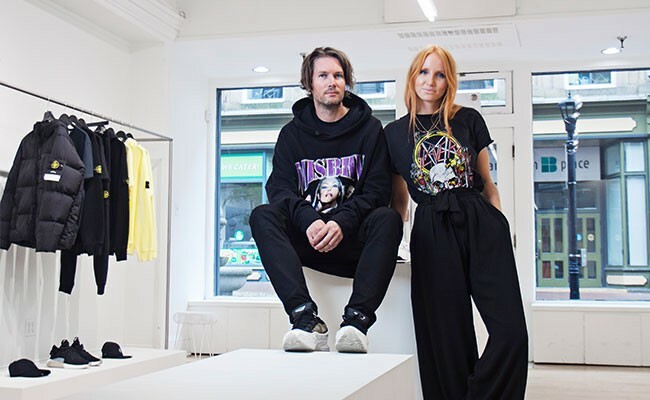 The store's buys are made in Berlin, Paris and New York, yet it's local. That's because the duo is committed to offering Halifax more options because we deserve it. As MacDonald puts it, RCHMND provides "local access to global fashion." Upon entering you immediately have an emotional connection with the pieces. I haven't had a such visceral reaction to clothing since ETRO's Fall 2008 menswear collection. RCHMND effortlessly creates a conversation not just about the things we put on but also how in simplicity we can find true beauty. The Omar Gandhi-designed space is a beautiful, breezy gallery. To the uninitiated, it may seem sparse. But that's because people like me need space for both the clothing and our emotions. "We see ourselves further progressing and refining what we are doing," says MacDonald. Smith echoes her partner's sentiments and adds, "we will have the same core values and will still be owner-operated. So often people create a business so they can replace themselves. I want to put more of myself into it." A shared a passion for rare streetwear inspired four friends to open Nova Scotia Kids, a boutique fuelled by hype.